Monday-Friday 9 am-7pm, Saturday 8 am-4:30 pm, Sunday No receptionist-classes only. One of Illinois' oldest community music schools, MIC' exceptional faculty serves over 5,000 students. 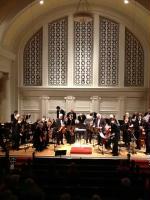 Institute for Therapy through the Arts, Barston Suzuki Center, The Academy & Nichols Concert Hall. Music Institute of Chicago's Winnetka campus is nestled below North Shore Country Day School on the west side of Green Bay Road just south of Willow. Entrances from lower and upper parking lots.